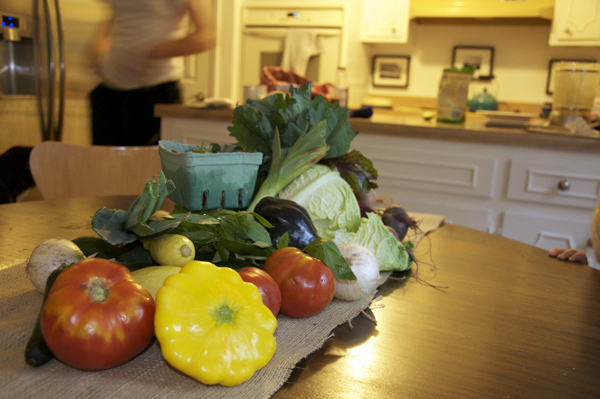 Yesterday was our CSA/farmer's market night. As far as June in Tennessee goes, it doesn't get more perfect: temperatures in the low 70s and sunny skies with a gentle breeze. I was almost chilly in my shorts and tee shirt! Max was absolutely loving the weather too, running circles around the playground and giggling up a storm. We made a few laps through the market after picking up our CSA goodies, sampling fresh-squeezed juice and coffee along the way, and purchasing two different varieties of locally raised sausage to feed relatives arriving in town next week. I think they'll be in for a treat! I finished my night with a cold cup of herbal infused, fresh-squeezed lemonade. Yum. 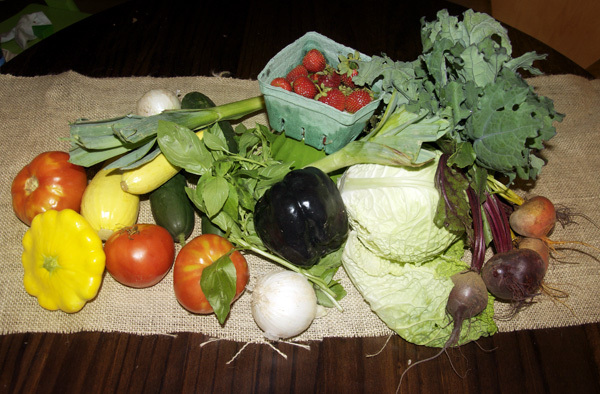 So on to the really fun part of this post ... showing you our CSA bounty! We did pretty well for ourselves this week, with squash, cucumber, onions, leeks, beets, tomatoes, strawberries (glorious strawberries! ), kale, a head of cabbage, fresh basil and even a beautiful purple pepper. I'm trying to get creative with meal ideas. Ever since the weather warmed up, I've been perfecting a white gazpacho, a dish inspired by our trip to Spain two years ago. Cucumber is a major ingredient, and this gazpacho is one of the only ways Ben will eat cucumber, so it seems like a no-brainer. Obviously with the cabbage I could make fresh coleslaw, but there's probably more creative uses out there. Any ideas?? And as for the beets - they're delicious any way you cook them, so it's just a matter of deciding what treatment sounds best! I'm pretty excited to get cooking and will share anything with you that's a hit. One thing that takes no effort is getting Max to eat these strawberries. He gobbles them up so fast that I could barely snap a photo in time!